Silvretta - Blue Silvretta - home of so many glaciers, is a mountain group in the centre of the Alps, belonging to the large Rhaetian Alps Group. It is surrounded by the Plessur and Raetikon Groups to the west, the Ferwall Group to the north, the Samnaun Group to the east as well as the Sesvenna Group and the Albula Alps to the south. Politically the countries of Austria and Switzerland meet on the Silvretta main ridge with a "three countries point" at Dreiländerspitze, where the Austrian states of Tirol and Vorarlberg meet with the Swiss canton of Graubünden. The highest summit of the Silvretta Group, Piz Linard, is located somewhat south of the main ridge, while the second highest summit, Fluchthorn, is located to its north. The most popular one, however, third highest of Silvretta, highest mountain of Vorarlberg, Piz Buin Grand is located at dead centre of the group. The area around the Silvretta Main Ridge is heavily covered in glaciers, which for a mountain range of this limited elevation is quite astonishing. However, since the group is located in the zone of westerly winds and since there are no higher groups in the direct vicinity Piz Buin and Piz Linard take the full onblow of any oncoming weather, creating an unusual amount of snow and ice. Consequently the group is very popular among skiers. Most ski runs are in the Austrian north and around the towns of Klosters and Davos in Switzerland. Tour skiing is also very popular in any part of the group though access routes can be rather long. Though it is not the geographical centre of the Rhaetian Alps, the Silvretta Group nevertheless is close to the emotional centre of Rhätien as we know it today. While much of the old Roman Province of Raetia got flooded by newcomers in the first centuries the regions at its centre long remained in local hands. Silvretta is a good example for that. The northern (Austrian) part of the area changed hands rather early when Bajuwarians migrated into the central parts of the Alps from the north, bringing with them the German Language. The high and hard to surmount passes of the Silvretta Group kept the newcomers in the north. Finstermünz Pass could not be travelled at the time so that the only way to the south was the western route, finally reaching Klosters and Davos. Consequently - if you have a look at the mountain names you will find German names in the north and west, Rhaetoromanic ones in the south. 360° panorama from Ochsenkopf, linked from wikipedia.com. Click image to go to the original at www.m-klueber.de. While researching the text for this page I came across a website with a number of brilliant panoramas. As it turned out, the owner of the site is also a member of SP, Mg-k who allowed me to use the above picture linked from wikipedia. His site is www.m-klueber.de and you can find a host of really brilliant pictures on it. While the subgrouping of the Silvretta Group is rather straightforward, thanks to the clearly defined ridges, the several subgroups might be named differently, when you look them up in literature. In most of the cases I chose the highest or most important summit to serve as the namesake though sometimes I reverted to geography (southern ranges), common sense (Main Ridge) or road passes (Flüela Pass). I'm open for any suggestion regarding the names so please feel free to post your comments. The Flüela Group is located to the south-west of the Silvretta Group. it is located between the Flüela Valley and Val Susasca to the south, Val Fless and Süsser Tal to the east, Val Vereina to the north and the Klosters / Davos Valley to the west. Klosters and Davos are the principal towns in the area and also the main trailheads. The group itself, despite its location close to these tourist towns does not have a single developed ski run and is thus still remote and solitary. The highest summit of the group is Flüela Wisshorn. Piz Linard is the highest mountain of the Silvretta Group. It is located to the south of the Silvretta main ridge, in a three ridged group. The boundaries of this group are Val Vernela to the north, Val Lavinuox to the east, Val Susasea to the south and Val Fless & Val Torta & Süssertal to the west. Mainvillage of the area is Susch in Lower Engadin Valley to the south of the group. To the south-east of the Silvretta Group, all along the north of the Unterengadin Valley between Val Lavinuoz in the west and Val Sinestra in the east you find a number of north-south running ridges, divided by deep and lonesome valleys. While the ridges could be counted as side ridges of the Silvretta main ridge I put them in their own subgroup here to get a bit more of a structure. The northern boundary of this subgroup actually is the main ridge, the highest summit is Piz Fliana (3281m). 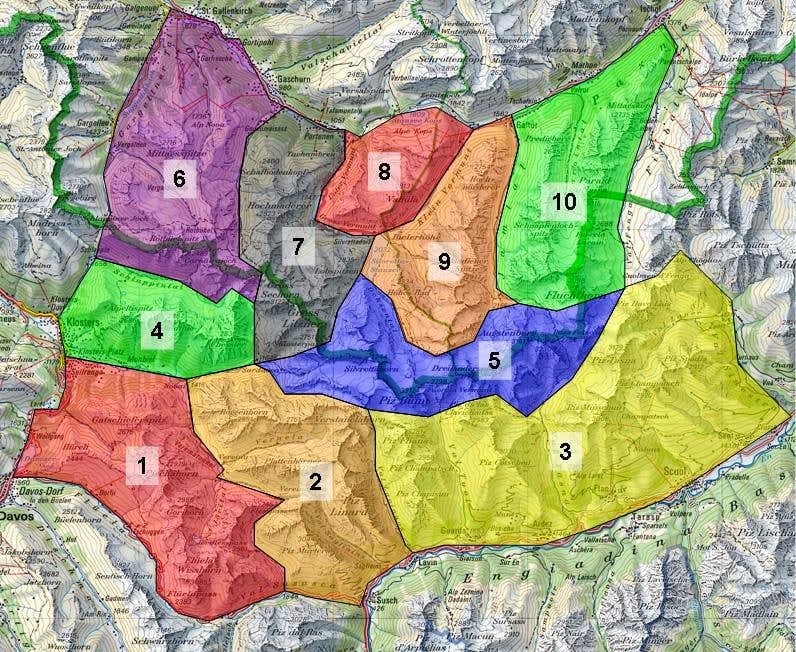 The most important villages are Lavin, Ardez and Scuol in Unterengadin Valley. The Schildflue Group - named after its central and highest summit is a short ridge to the west of the Silvretta Group. It is located north-east of Klosters between the Slappintal Valley in the north and west as well as the Sparra Valley to the south and east. The main ridge of the Silvretta group crosses the group from east to west, forming a slight s-bend. The Swiss / Austrian border follows it before turning northward at the eastern end. Here on the main ridge you find the highest (with one exception) and best known mountains of the group and the many large glaciers mentioned above in the overview section. While the ridge traverses the whole group its western part is generally divided between the Mittagspitze and Seehorn groups while the eastern part is discussed as a single part. Access to the ridge is long, especially from the north, where you have to take into account that the road access is rather long too already. Thus the easiest access routes follow the valleys which divide the southern ridges, starting from Lavin, Guardia, Ardez or Scuol. The Mittagsspitze Group is the north-westernmost of the subgroups of the Silvretta Group. It consists of two main ridges, both running from north to south and combining near the Silvretta Main Ridge. It is bounded by Gagellental to the west and Garneratal to the east. The highest summit is Rotbüelspitz (2852m) on the Silvretta Main Ridge. Much of the Seehorn Group belongs to the Silvretta Main Ridge, though there are long side ridges, both to the north and south. The Group is bounded by Garneratal Valley to the west as well as Untervermunt, Groß-Vermunt and Klostertal Valley to the east. The highest summit of the group is Großes Seehorn (3122m) on the main ridge. To the north of theSilvretta Group the Vermuntbach Creek does a large bend, starting in the east and circling the Vallüla Group. This is the smallest of all the Silvretta Groups and it is surrounded by lakes, man-made and natural alike. To its north you find the Kops Reservoir, to its east the Vermunt reservoir while to its south you find Bielerhöhe and the famous Silvretta Reservoir. Along the upper part of the Vermuntbach Creek as well as on the plateau to the West of Vallüla you find several more but smaller natural tarn lakes. Apart from the highest summit, Vallüla (2813m) there are only a handful of other mountains. From Dreiländerspitze (named since the Austrian states of Tirol and Vorarlberg meet with the Swiss canton of Graubünden here) on the Silvretta Main Ridge a long side ridge turns off to the north at the centre of which you will find Madlenerspitze. The ridge is bounded by Jamtal to its east as well as Klein Vermunt and Ochsental to its west. The highest summit of the ridge, Tirolerkopf (3103m) can be found close to the main ridge. The border between the Austrian states Tirol and Austria follows the Madlener Ridge all the way to the main ridge. Another long northern side ridge turns off the Silvretta Main Ridge near Grenzeckkopf (named for the sharp corner, the Swiss/Austrian border turns on its summit). This ridge culminates in the second highest summit of the Silvretta Group, Fluchthorn (3397m) before forking into two branches. Jamtal Valley is the western boundary while Fimbatal Valley forms the boundary to the eastern Samnaun Group. The nearest international airports are Innsbruck in Austria, Milano and Verona in Italy and Zürich in Switzerland. Take motorway A12/E60 west towards Landeck. There take B180/184 (B27 in Switzerland) across Finstermünz Pass to Unterengadin, to reach the southern side of the Silvretta Group. For the northern part, take Silvretta Hochalpenstrasse, B188. Take motorway A3 east to Vaduz. At exit Bad Ragaz take B28 to Davos and across Füelapass to Susch for the southern part of the group. Alternatively at Bad Ragaz turn north onto motorway A13 to Vaduz where you cross over via B191 to Feldkirch and motorway E60 east. At Bludenz turn south onto B188 Silvretta Hochalpenstrasse. Take the ring motorway north and leave for SS36 north. It will take you by Monza and Lago di Como until you reach Chiavenna. There turn Onto SS37 east in direction of St. Moritz. The road turns into B27 on the Swiss side of the border and takes you to Unterengadin and the south of the Silvretta Group. Take Motorway A22 (Brenner Motorway northward until you reach Bozen / Bolzano. There turn onto SS38, Vinschgauer Staatsstrasse, which takes you to Schluderns and from there on northwards to Reschenpass and Landeck, where you can turn onto B188 for the north of the Silvretta Group. For the south turn onto SS41 / B28 across Ofenpass and through Val Müstair to Unterengadin. The usual rules apply - leave plants and animals, take your refuse, keep dogs on leash etc. Also, you are in the border region between three European countries and though Italy and Austria belong to the EU, Switzerland doesn’t. Keep your Pass or ID handy. There are a good number of huts, alms and pastures in the range, serving almost any of the spots in the area. The following table gives an overview. Fergenhütte 2141 all summer all winter n.a. Each of the towns and villages of the area has a homepage with the possibility to book hotel rooms and apartments. Follow one of the links below. Great thanks! Hopefully other SP-members will attach more pictures to the mountains.